Who would have thought that sushi would have become such a populist food in Australia! Walking around Highpoint you can see many a squished sushi roll clutched in a toddler's fist (quite often that of my own kids). What's not to love - sushi rolls are healthy, cheap and delicious. It is important, though, to every so often remember that there is so much more to Japanese food than a chicken tempura hand roll and a fish-shaped soy sauce squirter. Thank you then for the tip that led me to Chiba, a fabulous Japanese restaurant in Moonee Ponds! I have come across a Japanese restaurant. Japanese-owned, serving AUTHENTIC, delicious food. 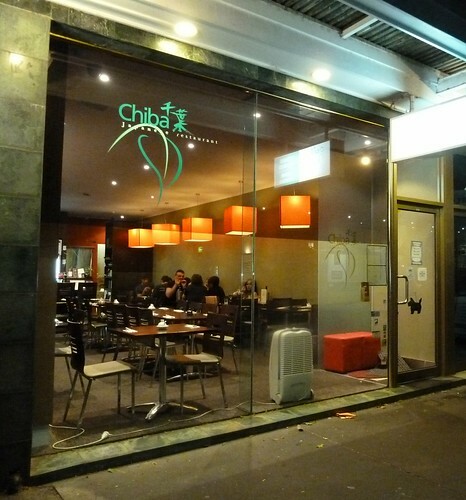 Arguably one of the best in Melbourne... Chiba Japanese Restaurant, Moonee Ponds. Really worth the visit! said an anonymous reader. Monday night, Christmas/New Year holidays - it will be dead, I thought. Thank God we booked anyway as it was packed, with tables constantly turning over. Complimentary edamame or fresh soybeans were delicious to start. I know why these are the Hollywood starlets' snack of choice - they are so healthy yet tasty, much "meatier" than regular beans. 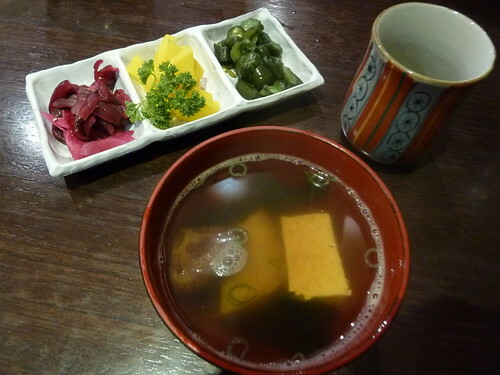 We bypassed the more ubiquitous miso to try something different, osuimono or "fish and tofu clear soup". The soup was fantastic - a bright, clean, zingy stock base, I think made with dashi, a stock unique to Japan made by carefully boiling dried tuna flakes and a type of kelp (seaweed). Inside the amber liquid floated juicy pieces of tofu, shiitake mushroom and white fish. Between sips we crunched on a selection of pickles including purple, tangy and slightly sweet umeboshi or plums, sweet, fluorescent yellow pickled daikon or radish, and a dark green, salty and acidic gherkin-style pickle. Look at this plate of utter perfection. The fish is the colour of delicate underwater coral, seemingly nestling between wavy fronds of green and white seaweed. We mixed the wasabi with soy in our bowls and dipped each slice. 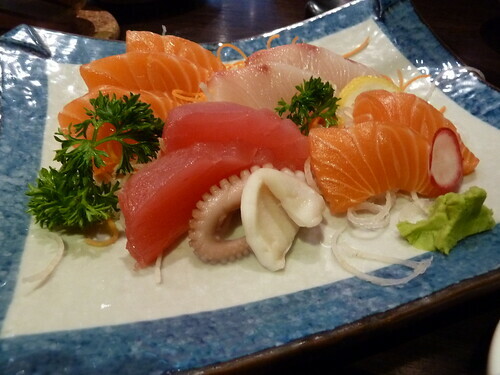 If there is anyone out there who has not discovered how good raw fish is, Chiba would be a great place to start. While cooked fish has a not at all unpleasant flaky texture, the flesh separating in petals or threads, raw fish is more solid, more gelatinous perhaps - similar to rare steak. The taste is actually much less strong than cooked fish. Ah, New Year's resolutions - they are easy when you are dining on sublime, Zen-like Japanese food! My favourite Japanese dish, fried eggplant spread with a smooth, sweet, white miso paste. 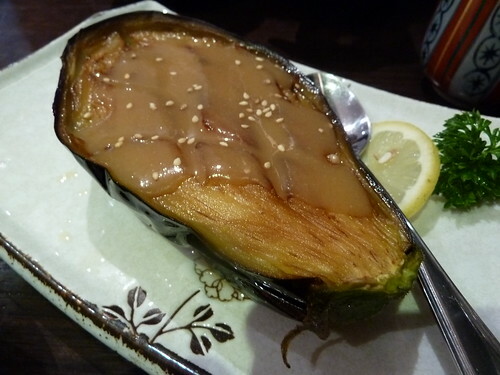 This eggplant was scored into diamonds, fried and then drizzled with sweet, nutty miso sauce. With a bowl of gohan or short-grain white rice, it was divine. Baby whiting fillets in that classic, ruffled tempura batter. 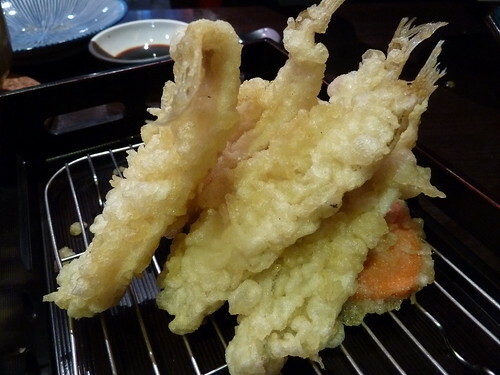 Good tempura batter is a mere whisper of crispness, merely clinging to the fish or vegetable. These came with a "radish dipping sauce" that was very light and sweet. Chiba have a lunchtime menu of noodle soups and rice dishes (which include a miso soup) that is exceptional value from $9.00 to $10.50. There's an extra discount for takeaway. A perfect coffee afterwards from Nabiha opposite would be just the icing on the cake. I love Footscray and always will, but I am far from monogamous. A rumour of warm, golden-brown burek or the seductive whisper of properly frothed milk for coffee is enough to send me hurtling down Ballarat Road in either direction. St Albans, 20 minutes' drive from Footscray, is my latest indulgence. 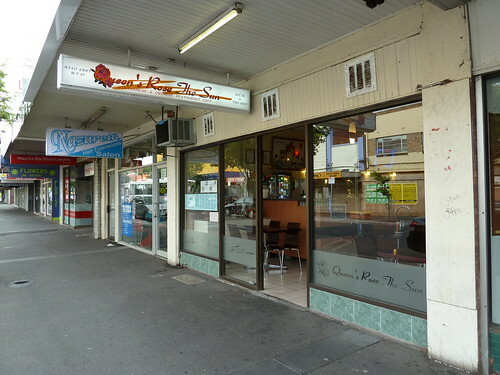 Unlike in Footscray, here a Balkan influence pervades, along with several enticing Vietnamese restaurants. 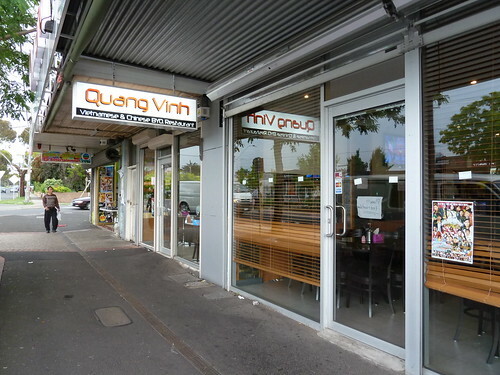 Quang Vinh in Alfrieda Street beckoned for a quick, weeknight dinner. These are sooo good. Chicken ribs are a fantastic cut of chicken that is not often available in butchers (they are in Footscray Market, though). They are almost like lollipops, with just one long central bone and lots of juicy meat around them, with no cartilage or stringy bits - far superior to more ubiquitous (though cheaper) drummettes and wingettes.﻿ "Salt and pepper" mean the meat will be deep-fried in a very crunchy, zingy coating and sprinkled with a totally delicious mix of lightly cooked garlic, chilli and spring onion. 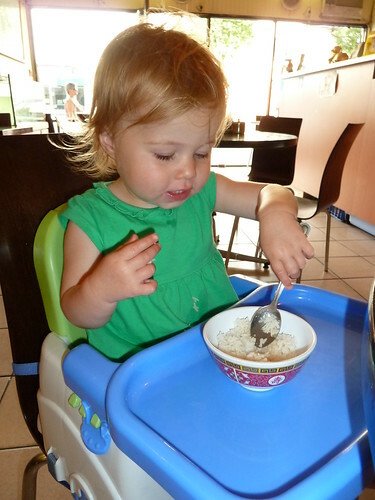 The grabbable nature of the ribs means the are very kid friendly, although arguably as nutritious as KFC! I love this style of mixed vegetables. Literally within three minutes of ordering this, it was on our table. The vegies are so lightly cooked and retain all of their fresh qualities of flavour, colour and crunch. With steamed rice and a little chilli oil from the bowl on every table, these alone would be a great meal. 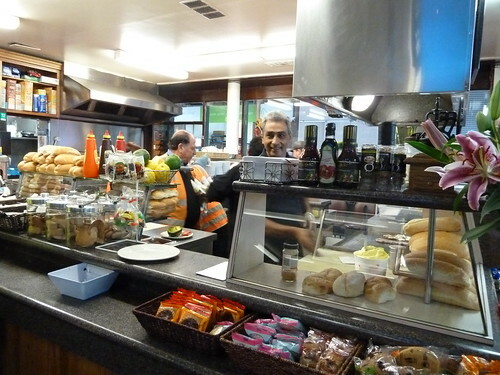 I really like this restaurant - the staff are very friendly, service is efficient and the food is really tasty and fresh. Their specialty is hu tieu mi noodle dishes, or dishes of egg and/or rice noodles with vegies and various meats, served either in a soup or 'dry' with a small bowl of soup on the side. For vegetarians, they also have "monk's vegetables" or "Buddha's delight", a dish of lotus root and various fresh and dried vegies traditionally eaten on Chinese New Year. Make sure you book if you are not going early - it is deservedly very popular! Pizza or pizze? Matchstick ham or prosciutto? Tap washer olives or unpitted kalamatas? Pizza in Melbourne has two fairly distinct incarnations, the Australianised version with "classic" toppings like Aussie (bacon & egg) or Meatlovers, versus the more authentic Italian style with little cheese and interesting toppings like zucchini flowers. Both styles of pizza have their place for me, though. The challenge is trying to find a decent Aussie-style, Friday night-takeaway, cold-in-the-fridge-for-breakfast-the-next-day pizza. 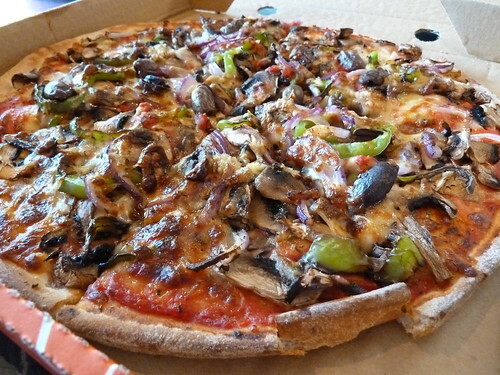 Eat Pizza is at the far edge of the City of Maribyrnong before you hit Ascot Vale. It looks like the average pizza place but its menu reveals a real treasure trove. As well as classic and "gourmet" pizzas, they do wholemeal bases, homemade gluten-free bases and vegan toppings such as vegan salami and vegan cheese! They offer an option of Virginia ham instead of the typical shredded style as well as sujuk which is a halal salami-style sausage. Pretty much the perfect Aussie-style vegetarian pizza. Well-cooked green capsicum, onion, thinly-sliced mushroom and whole (pitted) olives on a base that was neither thick nor thin. Most vegetarian pizzas suffer from a lack of salt but this was well-seasoned. Super generous on the jalapenos! The salami was spicy and had gone deliciously crisp on the edges. Another winner. If the well-made pizzas are my number one reason to go to Eat Pizza, it's very closely followed by their excellent pick-up deal, two large traditional pizzas, a salad and a bottle of soft drink for $21.90. The salad is just a simple mix of baby salad leaves, a wedge or two of tomato and a slice of cucumber but it does the job. The Baklover family is divided, though - Mr Baklover thinks Eat Pizza are all right, nothing special. Coming from the pizza capital of the United States, he is hard to impress. I think it's the best local option for this style of pizza and best of all, it's perfect cold the next day for breakfast - if it lasts that long! UPDATE! 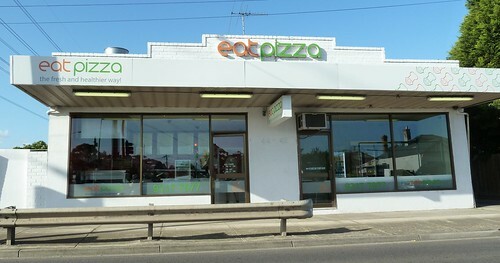 Now coming to the old Godfather's Pizza at cnr Gordon Street and Ballarat Roads, Footscray! 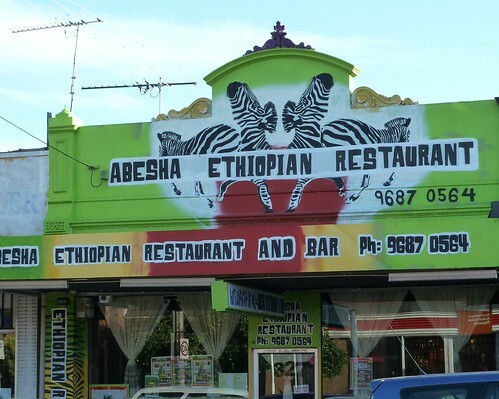 "you know the food's going to be good when the outside of the building is painted like a rasta zebra", says mobile reviewer Shain Singh of Abesha on Urbanspoon. Following this logic we chose Abesha as the venue for the inaugural Westside Food Bloggers' Meetup last December. The gun shop next door used to be on Abesha's current premises and the old sticker still makes me laugh. 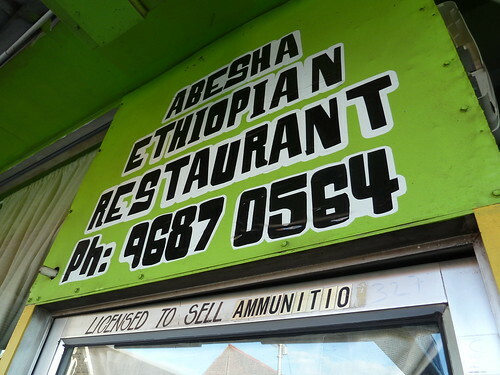 Footscray does have its fair share of odd combination businesses but injera and bullets would take the cake! It's cool inside with a slate floor and the traditional Ethiopian coffee ceremony corner that so many restaurants share. Above Ethiopian music videos play. I love the particular beat that their music has and the videos are so joyous. We left it up to the good folks at Abesha to bring us their choice of dishes. I tried to get all the names but we were all having too much of a nice time to stress too much, so here is a small selection, the names of which I am confident. 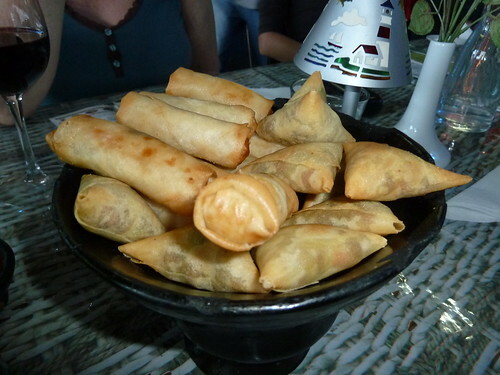 Above are a mixed plate of sambusa which are pastry-wrapped goodies resembling samosas. I had a curried vegie one that was quite nice. 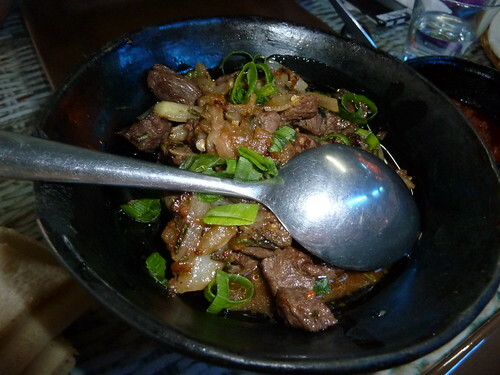 Tibs generally means that the meat is in chunks and the preparation will be dry, like a stir-fry, rather than a stew. I thought this was great, although others were so-so. The meat was neither tough nor overly tender, cooked in butter with onion. 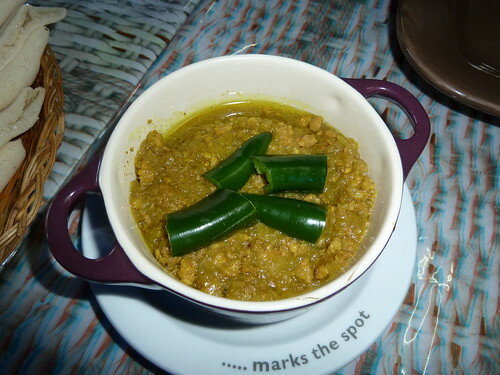 I do like African Town's tibs the best though, particularly as they have lots of fresh green chilli. This was delicious. 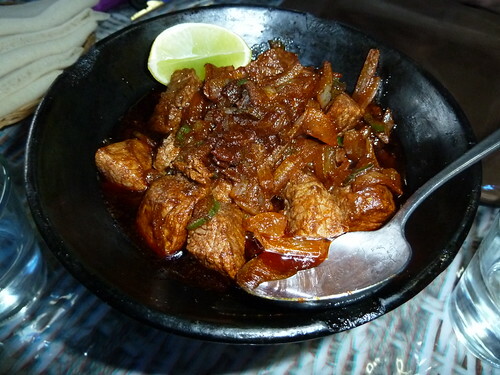 Chunks of beef cooked in a similar fashion to the tibs, in butter with onion but with the addition of berbere, Ethiopia's national spice blend. Wat in a dish description will mean it is a "wet" curry or stew whereas aletcha or alicha dishes will mean there is no berbere or hot spice, that it will be mild with the use of turmeric, ginger and garlic.﻿ This was a minced meat dish that was very mild and very delicious. 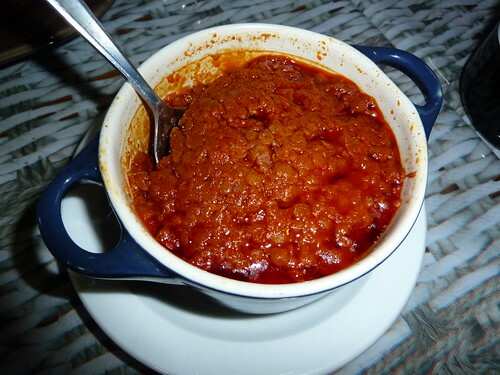 This is a stew of red lentils similar to the aletcha wat, the above minced meat dish, but here cooked with tender lentils and berbere hot red spice. The ginger was particularly prominent here and the lentils were very well cooked, not at all mushy and still retaining their shape. 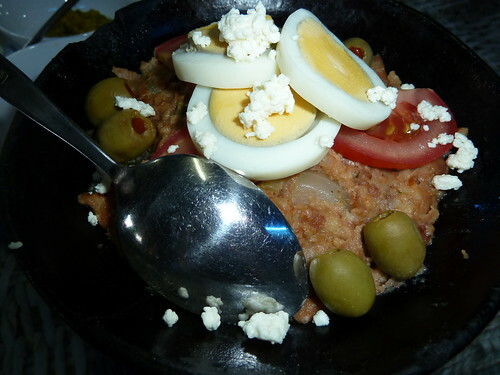 This is a mashed fava or broad bean dish which is common across much of the Middle East and East Africa. It is even seen in Syria and Lebanon where the broad beans are left whole and drizzled with yoghurt and olive oil (recipe from a friend coming soon). Others on the table enjoyed this version but I found it too plain, being more used to having the beans spiced and dressed with more cheese and oil. 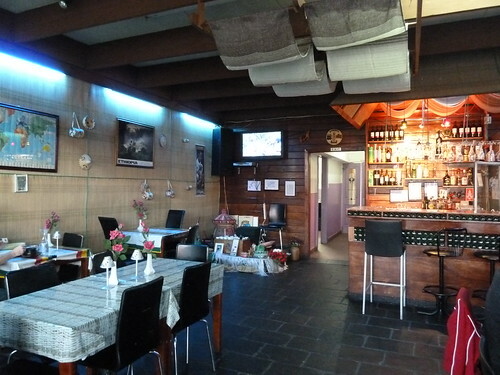 Other good versions in Footscray can be found at African Cottage and Khartoum Centre Restaurant. Ah, the best reason for eating Ethiopian food! Sometimes I want to lie back and put this over my eyes a la cucumbers. It is so soft, cool and delicious. 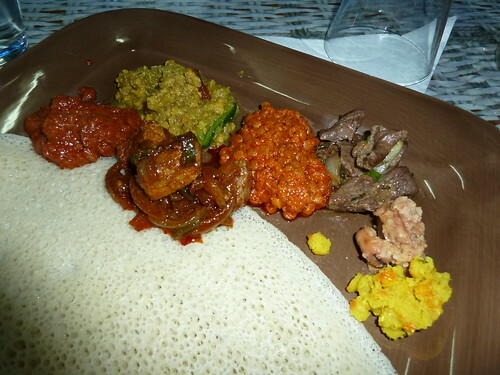 I put small dollops of each dish on my plate and used small pieces to pinch up morsels of each dish. 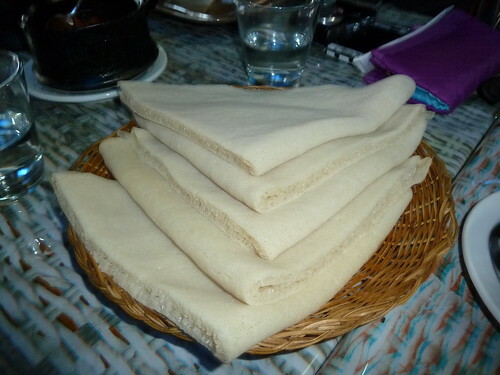 Mister did comment that the taste of each dish was quite different when not eaten with injera, as injera has quite a pronounced sour flavour, similar to sourdough bread, unlike something neutral like rice. The service was lovely and beers were cheap at just $5, although beware the $8 corkage. I did find the food somewhat oily, which I am sure is authentic - in many countries around the world, cooking oil is the main source of calories. The portion sizes did seem smaller compared to other local Ethiopian options but it was hard to judge in a large group meal situation. Nevertheless, I really enjoyed the food, and the company too! I have previously written about farmers' markets and I assumed that by cutting out the middleman, this could be nothing more than beneficial for both parties. The comments on that post surprised me somewhat to learn that farmers actually struggle to turn a profit at a farmers' market and many prefer to sell to the wholesale fruit & vegie market as has been traditional, and perhaps supplement that with farmgate sales. Like many Western suburbanites, I have driven past the wholesale fruit & vegie market in Footscray Road innumerable times and wondered what went on inside. It was so exciting then when Deb invited me on one of their regular tours - finally I could see the "missing link" in the chain that connected farmers with fruit & veg shops. So at 6am we donned fluoro yellow vests and boarded our little noddy bus for a 2-hour tour with our friendly and knowledgeable guide. 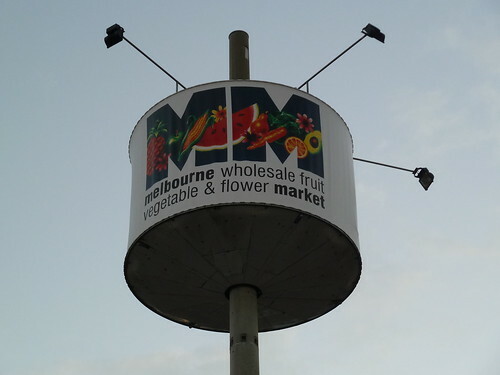 The wholesale fruit & vegie market has been on this West Melbourne site since 1969. Previously it was located at the Vic Market which basically ran 24 hours a day at that time - all night for wholesale and almost all day for retail. Under the long roof, the wholesalers line the outer edges of the market. These businessmen and women buy fruit and veg from various growers and then specialise in a certain range of produce, be it capsicums and stone fruit or sweet potatoes and ginger. Everything is sold by the box. There aren't any prices but apparently they are similar everywhere in the market. The wholesalers have snazzier premises and at the end of the day, put everything back inside, shut the rollerdoors and then turn on big cooling fans inside to refrigerate the produce until the next trading day. I learnt that La Manna bananas are actually a group of banana growers, not just an enormous plantation, who have banded together to become their own kind of cooperative. In the centre of the market are the small-scale producers. They are all within 2 hours of Melbourne, from Bacchus Marsh, Werribee, Cranbourne and other places. They come in every day and pack up everything at the end of that day to take it back to their farm. 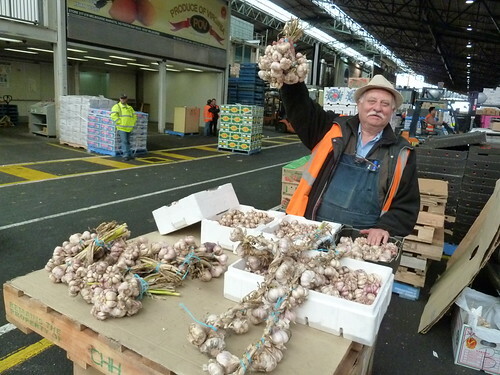 A group of us banded together and bought a huge bunch of Australian garlic from this lovely man, which we then split up between us. 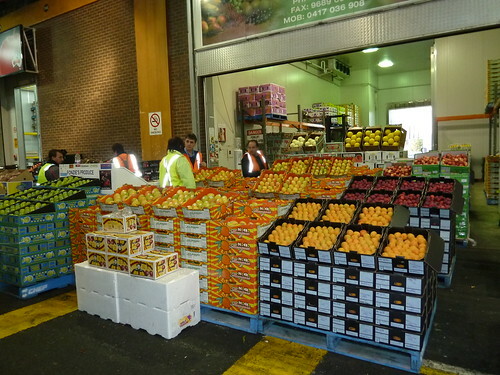 The wholesale fruit & vegie market supplies fruit & veg shops, retail market stalls and independent supermarkets. The big supermarkets generally have contracts with farms direct and buy their entire crop. It's like a little city inside the market with about five separate, independent cafes. There are forklifts everywhere travelling at buttock-clenching speeds, dodging pedestrians, weaving in and out of towering stacks of produce. There are also funny little sputtering, diesel-belching motorbikes with pallets attached that reminded me of the tuk-tuks in India. I highly recommend the tour - this is just a very basic overview. We had lots of great chats to both wholesalers and small-scale producers. The history of Melbourne, in particular that of its immigrants, is written all over this market. 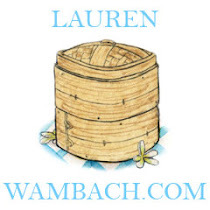 There are some family businesses here that are in their sixth generation! The tour gave me a much better appreciation of the links between grocer or market, farmer and consumer. And don't worry, you get a coffee included to cope with the 6 am start! Disclosure: Owner Sue is a friend of mine. I have a magnet I bought from Le Chien in Seddon a long time ago that says "Seddon - shh, it's a secret". Well, it was a long time ago! Seddon is such a sweet little village and has a great community feel. 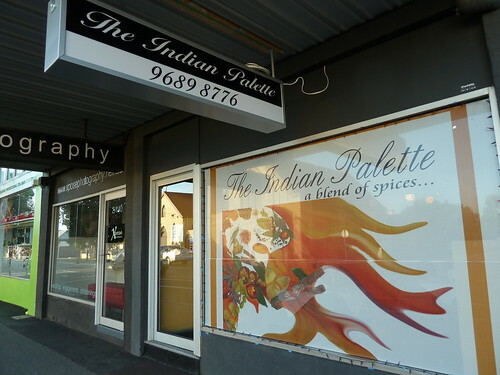 Now Seddon residents have their own Indian restaurant to add to the ever-diversifying restaurant lineup, The Indian Palette. The decor and presentation is rather genteel with embroidered napery and with high-backed, wooden chairs. It's very quiet inside - some Bollywood on the stereo would be very welcome. The menu is a tour of North and South India including a full range of tandoori dishes, plus a flourish of Indian-Chinese specialties. As well as all the classics, there are lots of interesting things like curries with gongura or sorrel leaves, gutti vankaya kura, mini eggplants with peanut and tamarind, and dal pancharangi made with five different types of lentil. 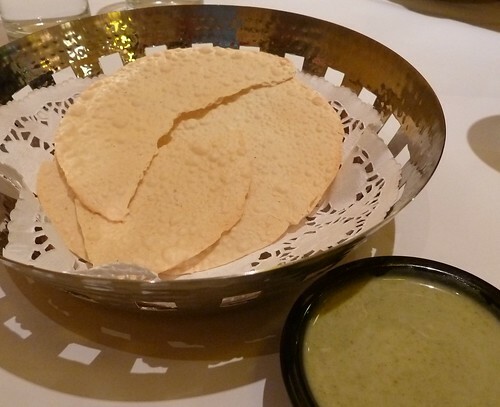 Caught mid-munch, complimentary pappadums to start with cool yet spicy mint and yoghurt sauce. Indian-Chinese food is not for everyone, but I love it. It's Chinese food reinterpreted for an Indian palate in the same way the Sino-Australian "classics" of lemon chicken and sweet and sour pork came into being. Soy sauce is used along with curry leaves and other classic Indian ingredients to create what I think are very unique and delicious flavours. 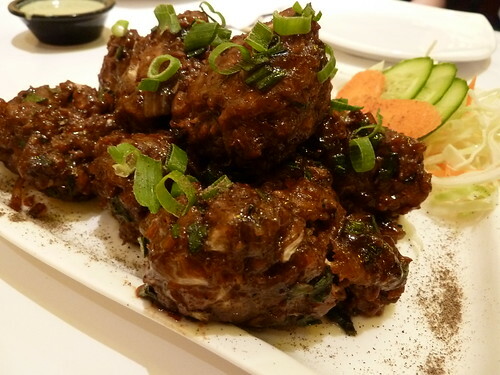 When Indians go to an Indian restaurant, they are often looking for the best chilli chicken or gobi Manchurian rather than rogan josh or dal makhani or the other "classics" non-Indians associate with Indian restaurants. Anyway, these Manchurian dumplings were balls of grated vegies including cabbage and carrot, deep-fried and tossed in a dark soy and black pepper sauce. They were a little oily but very moreish. 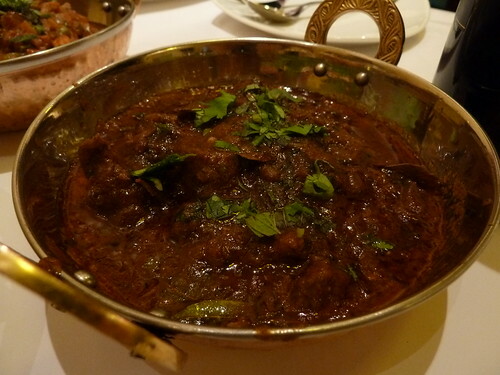 This is a dish from Madras in southern India, cubes of tasty lamb in a dark, slow-cooked, rich sauce full of curry leaves. It was delicious, very meaty but super spicy! Indeed, The Indian Palette don't mess around with spice so if you are not a fan of chilli, do ask for the dishes to be mild. An honest, homestyle dish of Indian fresh cheese and green peas, cooked in a tomato and onion sauce. This was great but also knock-your-socks-off hot. A serve of raita ($2.50) provided balance and cooled things down. It was filled with chopped onion and cucumber and sprinkled with cumin. The Indian Palette is just new and is still finding its feet somewhat. Their alcohol licence is still in the works (as of Dec 2010) so it is not yet licensed or BYO. Some music would be grand as well as a little bell on the counter for takeaway service or to get the bill. The prices have to be seen to be believed. 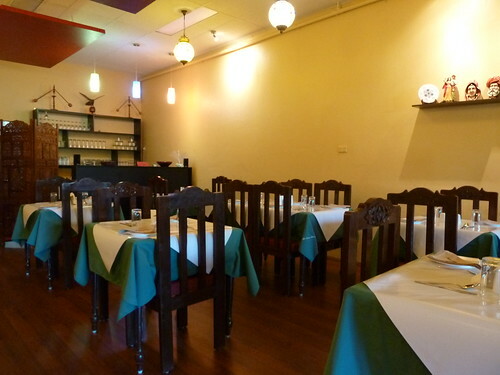 Most dals are $6, vegetarian mains from $7 to $10 and meat mains $8.50 to $12! That's Kitchen Samrat prices for Aangan quality, or very close to. Now that's a secret worth sharing. Another secret worth sharing is the new child-and-parent dance classes coming up at Jeremy McPherson Ballet and Dance School in Hillary Street, Braybrook (just near Central West). 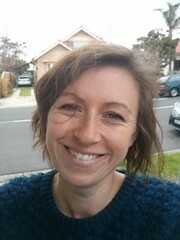 My friend Emily is the teacher and has a background in performance and teaching. She is a passionate and accomplished person and does nothing by halves, and her classes are just going to be brilliant, really unique. There are 3 levels, pre-crawler, crawler/toddler and preschooler, a steal at $110 per term. Free try-out class on Monday, 24 January. Check out the Facebook page and the recent Maribyrnong Leader article or call 9312 4664. Go Em!!! Queen's Rose The Sun - sounds like an old-man pub, doesn't it? It was only chance that made us park right outside this tiny Sunshine restaurant. We were planning a trip to big, bright and shiny Thuan An for fabulous goat curry, but I felt some sort of undertow to try this unassuming little eatery out. How glad we were we did! Eating at 5.00 pm meant we were the only patrons and we had plenty of room to spread out. The lovely waiter brought ceramic bowls for the grownups and plastic bowls for the kiddos, who amused themselves staring at the lonely barramundi hovering in his tank. 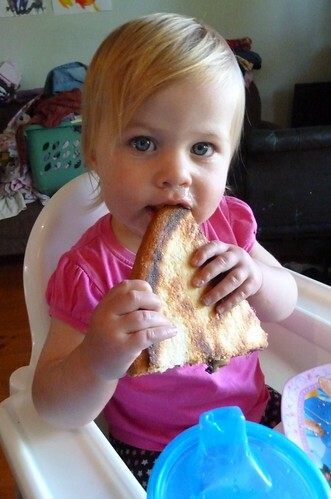 This wins Footscray Food Blog's unashamedly subjective award for best dish of 2010!!! 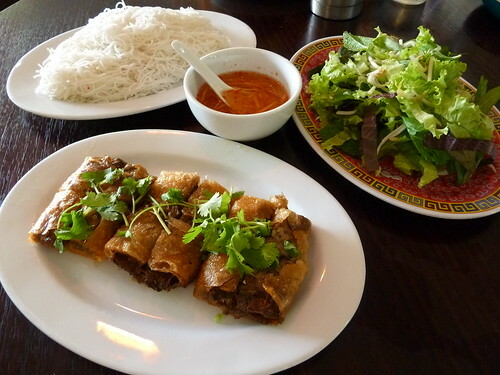 Nem ran is the Northern Vietnamese name for the classic spring rolls or cha gio, as they are known in the South. Cha gio were traditionally made with rice paper (as are rice paper rolls or goi cuon) but when the Vietnamese diaspora arrived in Australia, only Chinese wheat wrappers were available, and due to what I imagine is their comparative hardiness, wheat wrapping has persevered. I have had nem ran like this at Dong Que in Footscray, but Queen's Rose The Sun's version was different again. The nem ran were actually more like a patty or nem nuong, wrapped in rice paper to form a square packet, fried and then chopped into quarters. The meat filling was sublime - juicy, porky with cloud ear fungus (bad translation, delicious, textural foodstuff) and rice vermicelli. The wrapper was supremely crunchy and totally non-greasy. It came with a generous helping of warm rice vermicelli, a plate of lettuce, bean sprouts and mixed mints including purple perilla leaf, as well as perfectly balanced nuoc cham or sweet dipping sauce. We were instructed to make up our own warm salads. Such a simple, healthy meal yet perfectly rendered. Amazing! Queen's Rose The Sun has plenty of unique dishes on their menu, such as this bo chien don﻿, described as "stir fried beef with malt and honey sauce". 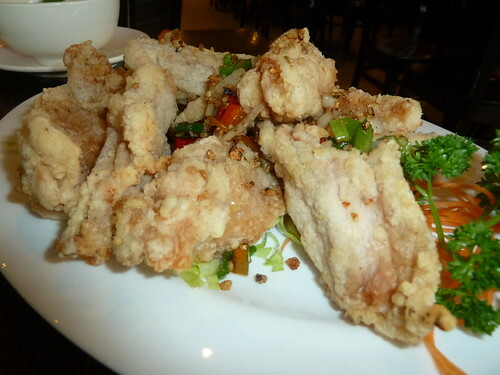 It came as deep-fried thin slices of beef with a very malty, almost molasses-like sweet and musky sauce. I thought the malt was actually quite overpowering but Mr Baklover loved it. 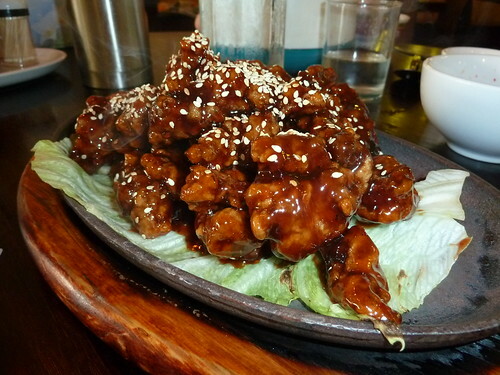 A good dish for a sharing table, perhaps. There were plenty of interesting vegie side dishes on the menu like kangkong or "water convolvulus" with preserved bean curd or shrimp paste, or even a simple "stir fried bean curd with bean shoot". That would be taking it too far for the Bak-kids, though. 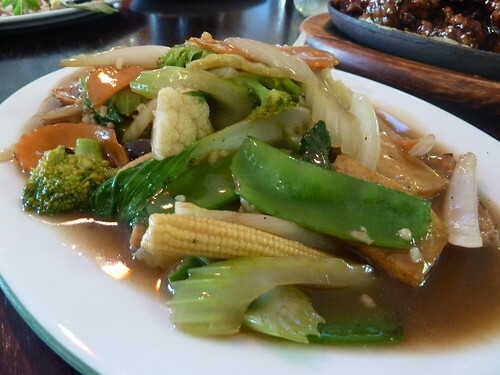 I'm not kidding anyone, really, as I love stir-fried vegies done simply like this. These were great - I do prefer less sauce, but when it is this tasty, I can live with it. The other impression I had when we left was there was zero MSG thirst afterwards. I will report back again after trying a soup here, as stocks traditionally harbour the most MSG, but it was literally refreshing to not have that creeping, insatiable thirst and burning throat that often follows a (quite delicious) yum cha or bowl of pho. How fortuitous that we stumbled into this little Sunshine gem. The prices were very reasonable, too. 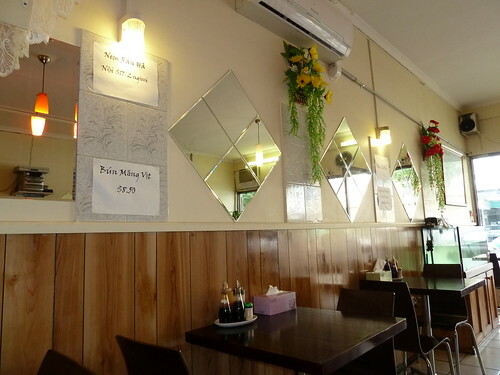 It will be hard to go past the nem cha ran Ha Noi next time, but perhaps Mr Barramundi can be our next course - yum yum!